Julian Carter and her son Stephen are caught in a tempest and then separated from each other. The story that follows is a the transformational epic of Julian and the dangerous choices she makes to save her son. As many fans of Ted Dekker know, Ted was born and raised amongst the Headhunters in Indonesia where his parents served as missionaries. Ted has talked about some of his experiences there, but he has never gone in depth. With Outlaw, he does. The setting of the novel and the culture of the Tulim brings to life a world not many people experience. Ted opens a door to a world that is much different yet somehow the same as our own. For the first twenty pages or so, I did not feel like I could connect with the characters, but after reading some more, I realized that it wasn’t because of Ted’s writing, but that it was because of the exoticness of the story that I was having a hard time. As soon as things were more fleshed out and explained, I began to connect. Julian’s story which is told in first person and takes up three fourths of the book is moving and unlike anything Ted has done in his previous stories. The message of the story has been used many times throughout Christian fiction, but it has never been done as vividly and beautifully as it is in Outlaw. 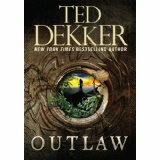 With Outlaw, Ted has created a powerful story that will speak to people and make them want to read it again and again.